Jeep Wrangler Interior, Sat Nav, Dashboard | What Car? 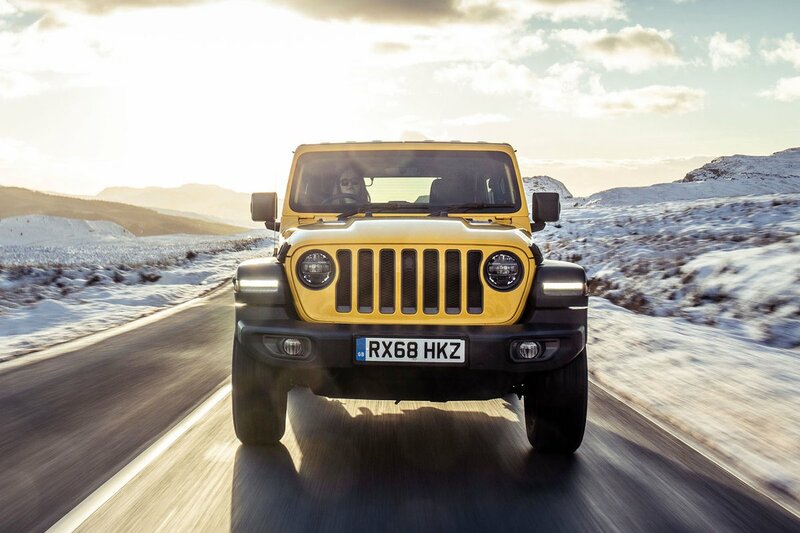 If you appreciate a commanding driving position, you’ll love the Wrangler’s. You step up into a comfortable seat, with a great view down the long bonnet and onto the road ahead. Annoyingly, though, there’s no place for your left foot at all due to an intruding central console. You’re forced into quite an unnatural position that can get uncomfortable after a while. Despite being a big beast, managing its size is easier than you might expect, thanks to how the wheel arches clearly mark out the sides of the car. That lofty driver’s perch and big windows aid all-round visibility, too, with a reversing camera and parking sensors optional for extra help. On the dashboard, things are a mixture of old and new school. Even entry-level Sahara models come with a configurable 7.0in LCD display between the dials in front of the driver, as well as Jeep’s biggest 8.4in touchscreen infotainment system, with navigation and European maps, Apple CarPlay and Android Auto smartphone mirroring included. Both screens have pin-sharp graphics, while the touchscreen is responsive and has menus that are easy enough to fathom. Our only complaints are that there are no physical shortcut buttons and some icons are a little small. As well as the usual functionality, there are off-road-specific pages on both displays that can show vital statistics such as the angle you’re driving at and the temperatures of the mechanical gubbins underneath you. 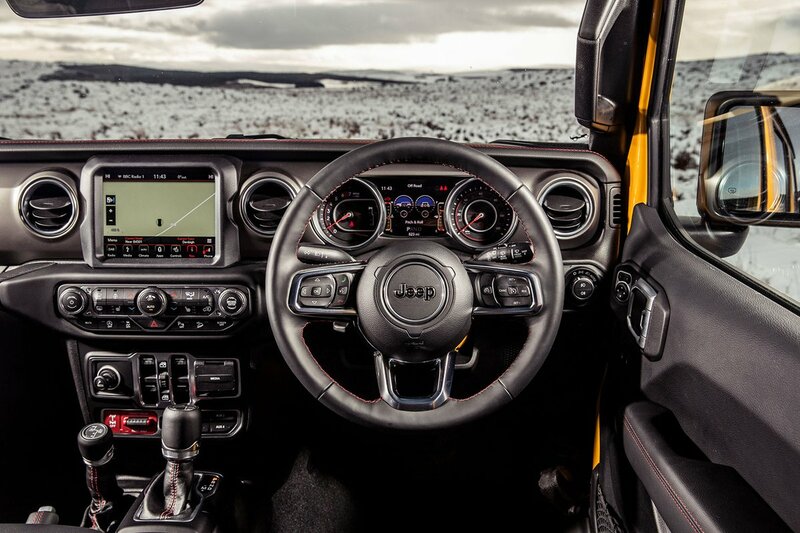 Interior quality has certainly been improved compared to the previous Wrangler. There’s soft-touch plastic around the centre console and on the door handles, a supple leather steering wheel, solid-feeling switches and even a leather-wrapped dashboard panel on Sahara models. Sure, it’s no Audi Q5, but the german SUV can’t claim to have an interior you can hose mud out of.. Although we’ve been impressed so far, lesser Sport models get a smaller touchscreen and fewer bits of plush trim. 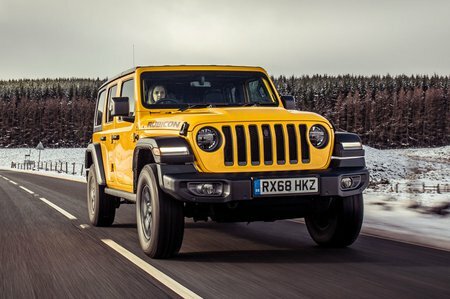 We’ll have to get our hands on one of those to know exactly how good the Wrangler is at that lower price point.